The Roman legionary fought first and foremost with his contubernium, the basic eight man unit of the Roman army. The men of the same contubernium fought, slept, ate, and trained together. This strong sense of comradery gave Roman legionaries a sense of pride and kept them fighting on the battlefield. The standard bearers, signiferi, also were of huge importance in keeping Roman soldiers in the battle. 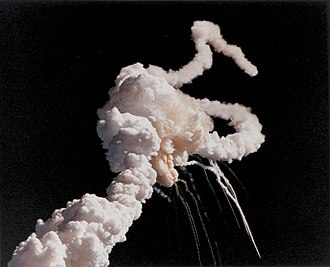 The loss of a standard was an immense disgrace to the century the standard belonged to. As such, standard bearers served as someone to rally around and as someone to exhort legionaries to battle. Optiones, Roman officers at the rear of a formation, had many essential roles outside of battle. However, during battle, they were essential in preventing legionaries from routing. Carrying a staff with a ball-end, an optio would prod and hit legionaries fleeing from battle back into formation. Leading at the front, centurions would fight alongside legionaries underneath his command, serving as a role model for his legionaries to remain in combat. ^ a b A companion to the Roman army. 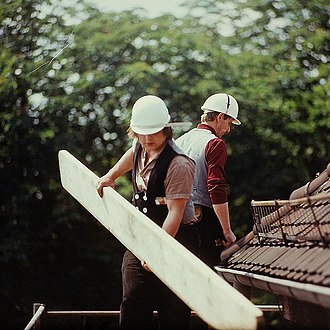 Erdkamp, Paul. Malden, MA: Blackwell. 2007. ISBN 9780470996577. OCLC 184983640. ^ a b The Cambridge history of Greek and Roman warfare. 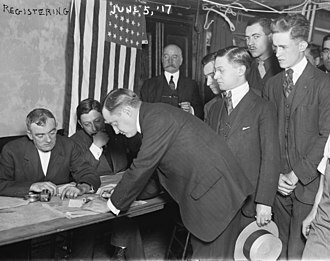 Sabin, Philip A. G., Wees, Hans van., Whitby, Michael. Cambridge: Cambridge University Press. 2007. ISBN 9780521857796. OCLC 190966775. ^ a b A companion to the Roman Empire. Potter, D. S. (David Stone), 1957-. Malden, MA: Blackwell Pub. 2006. ISBN 0631226443. OCLC 60550606. The Scutum was a type of shield which was in use among Italic peoples in the archaic period. 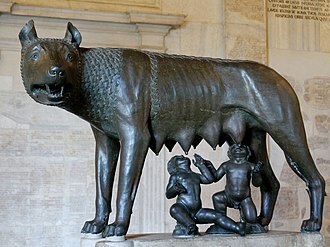 It was adopted by the army of ancient Rome and this was probably in the fourth century BC. 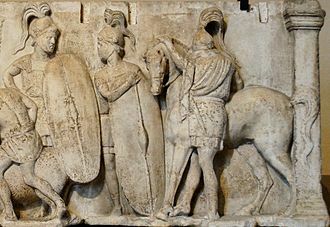 The Romans adopted it when they switched from the formation of the hoplite phalanx of the Greeks to the formation with maniples. In the former, the soldiers carried a round shield. In the latter, they used the scutum, which was a larger shield, originally it was an oblong and convex shield. By the first century BC it had developed into the rectangular, semi-cylindrical shield we, in modern times and this was not the only shield the Romans used. Roman shields were of varying types depending on the role of the soldier who carried it, oval and rectangular shields were used throughout Roman history. 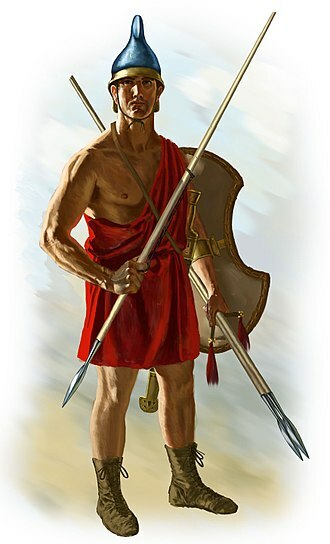 In the early days of Ancient Rome Roman soldiers wore clipeus, which was like the aspides, the hoplites were heavy infantrymen who originally wore a bronze shield and helmet. 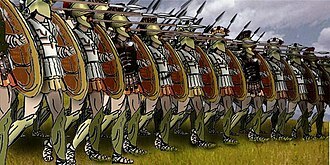 The phalanx was a compact, rectangular mass military formation, the soldiers lined up in very tight ranks in a formation which was eight lines deep. The same number of men became accepted by the Roman Senate as emperor during this period and so became legitimate emperors. Later, Aurelian reunited the empire, the crisis ended with the ascension, the situation of the Roman Empire became dire in 235 AD, when emperor Alexander Severus was murdered by his own troops. Many Roman legions had been defeated during a campaign against Germanic peoples raiding across the borders, leading his troops personally, Alexander Severus resorted to diplomacy and paying tribute in an attempt to pacify the Germanic chieftains quickly. According to Herodian this cost him the respect of his troops, in the years following the emperors death, generals of the Roman army fought each other for control of the Empire and neglected their duties of defending the empire from invasion. 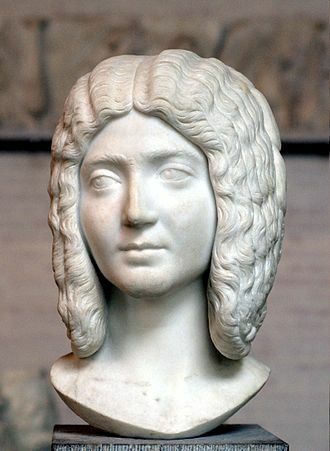 Climate changes and a rise in sea levels ruined the agriculture of what is now the Low Countries forcing tribes to migrate, additionally, in 251, the Plague of Cyprian broke out, causing large-scale death, possibly weakened the ability of the Empire to defend itself. 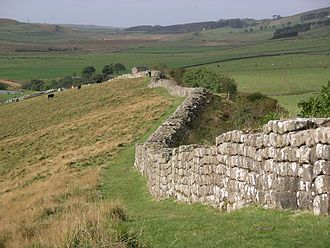 After the loss of Valerian in 260, the Roman Empire was beset by usurpers, the Roman provinces of Gaul and Hispania broke off to form the Gallic Empire. An invasion by a vast host of Goths was defeated at the Battle of Naissus in 268 or 269 and this victory was significant as the turning point of the crisis, when a series of tough, energetic soldier-emperors took power. Victories by the emperor Claudius II Gothicus over the two years drove back the Alamanni and recovered Hispania from the Gallic Empire. 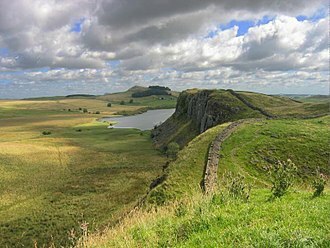 When Claudius died in 270 of the plague, who had commanded the cavalry at Naissus, succeeded him as the emperor and continued the restoration of the Empire. Aurelian reigned through the worst of the crisis, defeating the Vandals, the Visigoths, the Palmyrenes, the Persians, by late 274, the Roman Empire was reunited into a single entity, and the frontier troops were back in place. 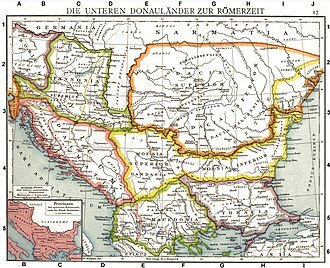 More than a century would pass before Rome again lost military ascendancy over its external enemies. However, dozens of formerly thriving cities, especially in the Western Empire, had ruined, their populations dispersed and, with the breakdown of the economic system. Caracalla, formally Marcus Aurelius Severus Antoninus Augustus, was Roman emperor from AD198 to 217. 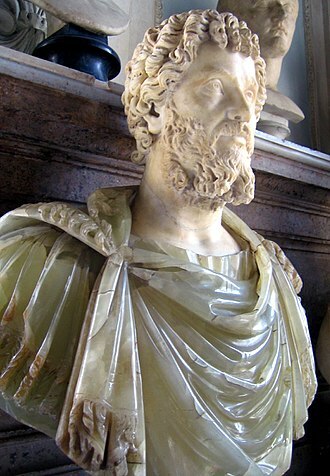 A member of the Severan Dynasty, he was the eldest son of Septimius Severus, Caracalla reigned jointly with his father from 198 until Severus death in 211. 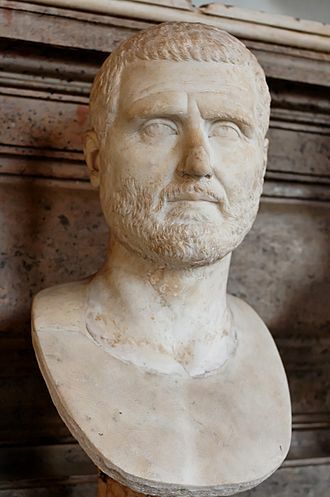 Caracalla ruled jointly with his younger brother Geta, with whom he had a fraught relationship, Caracallas reign was marked by domestic instability and external invasions from the Germanic people. Caracallas reign was notable for the Antonine Constitution, known as the Edict of Caracalla, the edict gave all the enfranchised men Caracallas adopted praenomen and nomen, Marcus Aurelius. 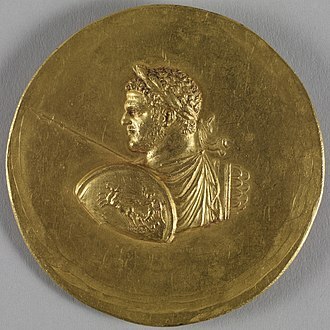 Towards the end of his rule, Caracalla began a campaign against the Parthian Empire and he did not see this campaign through to completion due to his assassination by a disaffected soldier in 217. 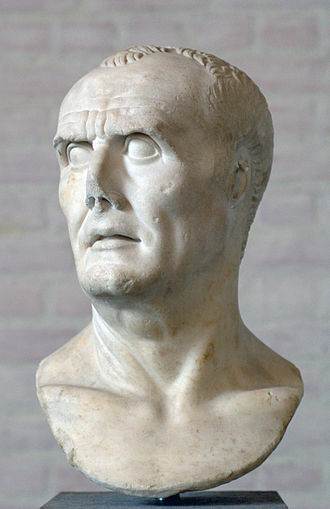 He was succeeded as emperor by Macrinus after three days, Caracalla is presented in ancient sources as a tyrant and cruel leader, an image that has survived into modernity. 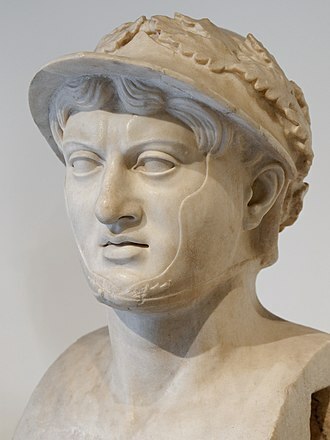 Dio Cassius and Herodian present Caracalla as a soldier first and emperor second, in the 12th century, Geoffrey of Monmouth started the legend of Caracallas role as the king of Britain. Later, in the 18th century, Caracallas memory was revived in the works of French artists due to the parallels between Caracallas apparent tyranny and that of King Louis XVI, Modern works continue to portray Caracalla as a psychopathic and evil ruler. 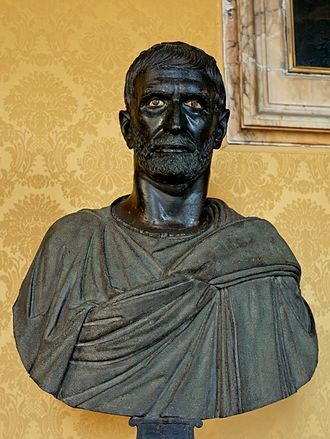 His rule is remembered as being one of the most tyrannical of all Roman emperors, Caracalla was born Lucius Septimius Bassianus. He was renamed Marcus Aurelius Antoninus at the age of seven as part of his fathers attempt at union with the families of Antoninus Pius and Marcus Aurelius. 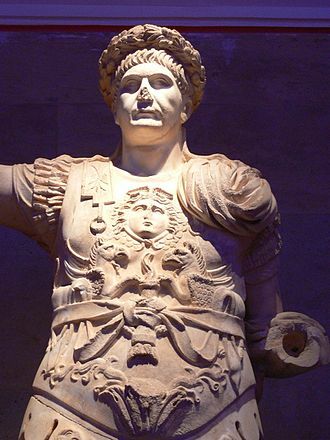 According to Aurelius Victor in his Epitome de Caesaribus, he became known by the agnomen Caracalla after a Gallic hooded tunic that he habitually wore and he may have begun wearing it during his campaigns on the Rhine and Danube. Dio generally referred to him as Tarautas, after a famously diminutive, Caracalla was born in Lugdunum, Gaul, on 4 April 188 to Septimius Severus and Julia Domna. Gladius was one Latin word for sword, and is used to represent the primary sword of Ancient Roman foot soldiers. Early ancient Roman swords were similar to those of the Greeks, from the 3rd century BC, the Romans adopted swords similar to those used by the Celtiberians and others during the early part of the conquest of Hispania. This sword was known as the gladius hispaniensis, or Hispanic Sword. A fully equipped Roman legionary after the reforms of Gaius Marius was armed with a shield, one or two javelins, a sword, often a dagger, perhaps in the Empire period, darts. Conventionally, soldiers threw javelins to disable the shields and disrupt enemy formations before engaging in close combat. 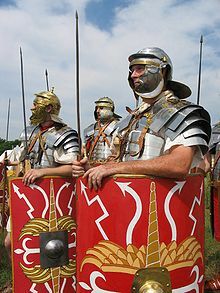 A soldier generally led with the shield and thrust with the sword, all gladius types appear to have been suitable for cutting and chopping as well as thrusting. Gladius is a Latin masculine second declension noun, gladius in Latin refers to any sword, not specifically the modern definition of a gladius. The word appears in literature as early as the plays of Plautus, modern English words derived from gladius include gladiator and gladiolus, a flowering plant with sword-shaped leaves. Manlius strapped on the Hispanic sword, during the combat he thrust twice with it under the shield of the Gaul, dealing fatal blows to the abdomen. He removed the Gauls torc and placed it around his own neck, hence the name, the combat occurred during the consulships of C. About 361 BC, long before the Punic Wars, but during the wars with the Gauls. One theory proposes the borrowing of the gladius from *kladi- during this period. Gladius may have replaced ensis, which in the literary periods was used mainly by poets, the exact origin of the gladius Hispanus is disputed. Arguments for the Celtiberian source of the weapon have been reinforced in recent decades by discovery of early Roman gladii that seem to highlight that they were copies of Celtiberian models. The weapon developed in Iberia after La Tène I models, which were adapted to traditional Celtiberian techniques during the late 4th and these weapons are quite original in their design, so that they cannot be confused with Gallic types. 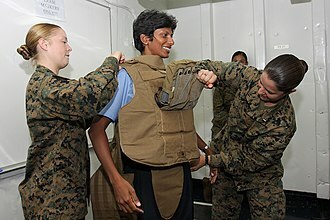 Heavy infantry refers to heavily armed and armoured infantrymen trained to mount frontal assaults and/or anchor the defensive center of a battle line. As such, the heavy infantry almost always refers to pre-Gunpowder Age troops. In ancient Greece the Hoplite was a form of heavy infantry. All hoplites had a shield and spear, and perhaps a helmet as well, wealthier hoplites were able to afford bronze breastplate or linothorax armor, while poorer hoplites wore little to no armor. The hoplite armor and shield were designed to block arrows and blows from spear points, hoplites would act as both a city watch and as an army in the field. Hoplites were thought of as a force to be reckoned with because they would form a phalanx, a band of spearmen. Herodotus has described an elite infantry unit of 10,000 soldiers. They were reportedly carrying wicker shields, short spears, swords or large daggers, underneath their robes they wore scale armour coats. The regiment was followed by a caravan of covered carriages, alexanders army employed infantry known as the phalangite - soldiers equipped with a small shield and long pike, and employed in a formation known as the sarissa phalanx. Alexander had a heavy infantry force known as the Argyraspides, or silver shields. 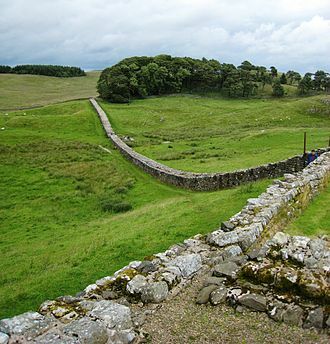 The Celts were a group of people that through migration. 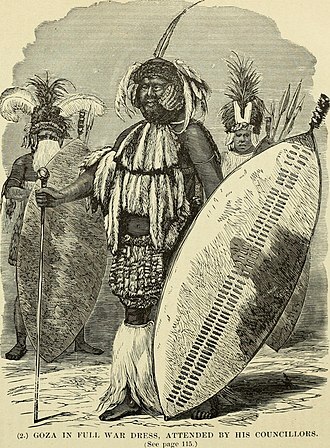 A people with a warrior tradition, they varied greatly in battle. Some of the heavier armed Celts wore chainmail and Galea type helmets, Celts were respected for their battle prowess and often served as mercenaries for other Mediterranean civilizations. In the Military of ancient Rome, heavy infantry made up most of the Roman army, the heavy infantry of the pre-Marian Roman republic included the Hastati and Triarii. The hastati, the youngest men in the line, were armed with a sword, or gladius, the pila were usually thrown at a charging enemy before they were engaged in hand-to-hand combat. Hastati were equipped with a helmet, a shield and a bronze breast plate or coat of mail, the principes were armed just like the hastati, but they were older, more experienced and, because they had more money, were more likely to own better-quality arms. The final type of infantry were the triarii. Roman military personal equipment was produced in large numbers to established patterns, and it was used in an established way. 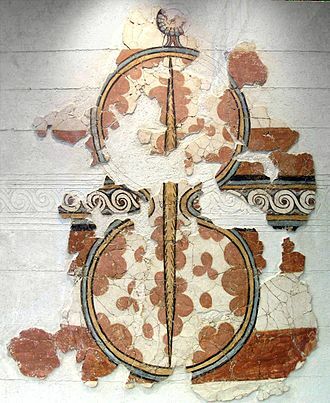 These standard patterns and uses were called the res militaris or disciplina and its regular practice during the Roman Republic and Roman Empire led to military excellence and victory. 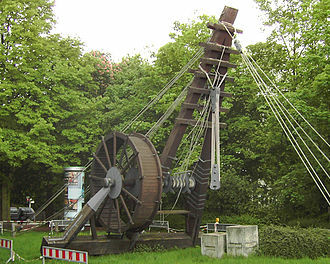 Roman equipment gave them a distinct advantage over their barbarian enemies. This did not imply that every Roman soldier had better equipment than the men among his opponents. According to Edward Luttwak, Roman equipment was not of a better quality than that used by the majority of its adversaries, they used weapons based on Greek and Etruscan models. On encountering the Celts, they based new varieties on Celtic equipment, to defeat the Carthaginians, they constructed an entire fleet de novo based on the Carthaginian model. Once a weapon was adopted, it became standard, the standard weapons varied somewhat during Romes long history, but the equipment and its use were never individual. Vegetius, 4th-century author of De Re Militari, describes the equipment he believed had used by heavy. The other smaller had five ounces of iron and a stock of three and one-half feet, and was called a vericulum but now is a verutum, the first line, of hastati, and the second, of principes, were composed of such arms. Behind them were the bearers and the infantry, whom now we say are the supporters. There were likewise bowmen with helmet, coat of mail, arrows, there were slingers who slung small stones in slings or cudgel-throwers. There were artillery-men, who shot arrows from the manuballista and the arcuballista, in the late Roman Republic, and the early Roman Empire, most Roman infantry used swords and specialized throwing spears as their main weapons. 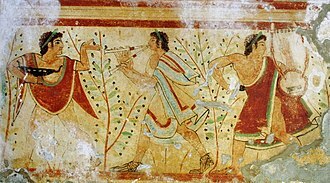 In the middle and Late Roman Empire, most Roman infantry used thrusting spears as their main weapons, a pugio was a dagger used by Roman soldiers. Like other items of equipment, the dagger underwent some changes during the 1st century. Generally, it had a large, leaf-shaped blade 18 to 28 cm long and 5 cm or more in width, a raised midrib ran the length of each side, either simply standing out from the face or defined by grooves on either side. The testudo performed during a siege, as shown on Trajan's Column. There are faint eagle-wing and thunderbolt motifs on the scuta. Medieval Coat of Arms of king Matthias Corvinus (r. 1458-1490), guarded by Black Army heavy infantry men. Matthias Church, Budapest. The damaged art relic was renovated in 1893.